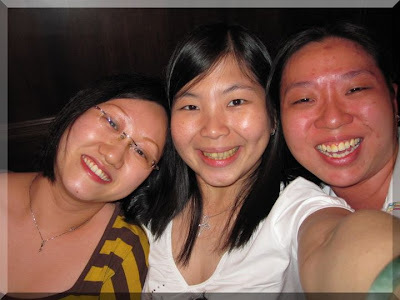 I had a small reunion with my ex-school mates from LR last night. One from Philipinnes together with his fiancee, they are now working and staying in Singapore, plan to get married next year back in Philipinnes. One is from Indonesia, but her hubby is working and staying in Singapore. She comes and goes from Indo to Sg at least once a month and has a plan to stay here long term. And another one is Singaporean friend who I meet more often down here. 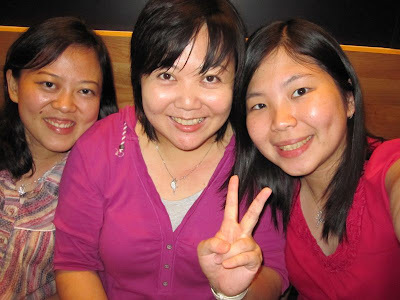 So for the rest two, I hadn't met up with them for almost ten years. After posting our picture to fb, my Taiwanese friend wrote a comment asking when will we be there for reunion. Hehehehe... 2 days after that, I bought the tickets online. Just nice, my friend also wants to go there. Initially there was another friend who is interested to go, but since the time will be clashed with CNY reunion and she has to be there with her husband's family, she then can't make it. So it's just me and my friend. I plan to have a relaxing holiday there. Not really concentrate on sightseeing. More like eating, drinking, walk a bit, gathering, if possible have a bath in hot spring. Weather will be cool when I'm there. Yay!! So exciting! Everytime I passed by escalator and MRT at Chinatown, I always see the visit Taiwan advertisement. In months to come, I will go there and experience it myself!! Yihaaa!!!! Hope everything goes on smoothly.. Wish me luck ok? Have a great week ahead!!! Wow!! This morning my friend has finally come back from her 1 month unpaid leave. She went to Canada to meet her bf. It seems just like yesterday. When she appeared in front of me, it seems like a dream to me. I thought she was going to extend her stay there and tender her resignation from there, but she didn't. But she is very sad the fact that she has to leave him. She kept crying on her way back to Singapore. Long distance relationship. I should be very lucky that I don't have to encounter that anymore. I hope I don't have that anymore. Living together with loved ones, nothing can make me happier than that. This morning I accidentaly erased all sms in my phone, including all outgoing and incoming one. Hahaha... But it reminds me of impermanent, that everything in life will disappear one day, it's just a matter of time. All those young faces, beautiful body, the good health, one day everything will disappear. Young becomes old. Beauty becomes not beauty anymore. Healthy may become inhealthy. But what remains are the beauty that is kept inside, which is inner beauty. Kindness, compassionate, honesty, etc. Well, it can change as well, but at least that can be reserved as long as people is willing to do so. Anyway... Again.. Be happy with what you have. Be satisfy. That will be the ultimate goal of happiness. Rather than having a lot, but never feel satisfy. Write 'til here. Have a great week ahead!!! 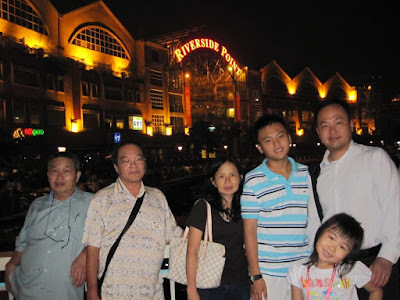 As for last Thursday, my aunt and uncles came to Singapore. 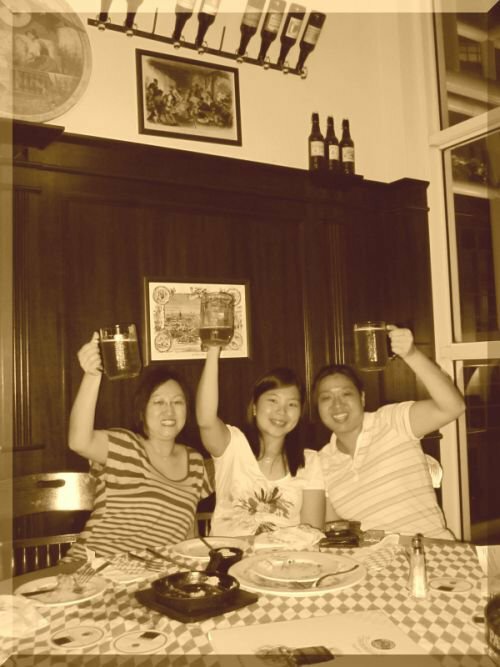 They stopped by Singapore just for a night to have dinner at restaurant where I work. So coincidentally there is Heritage Promotion and they were able to try many different local dishes plus fresh durian. I didn't take their pictures during dinner, but we took some pictures with a view of Clarke Quay. All present forms of life and circumstances are the results of Karma accumulated from our previous lives. Be they good or evil, our Karmas are all contaminated. The fruits corresponding to them are therefore subject to imperfections and suffering. One who can subdue the body and mind well to maintain tranquility of the psyche is a wise and worthy person. He who controls the body but not the mind, on the other hand, can never attain true freedom and transcendence. Confucians, too, maintain that "all things exist in well-being when viewed in calmness". Only when the heart calms down can there be fullness and meningfulness in life. Gather that outward-grasping mind together. Let it fall back on your original Mind and pristine nature. Your mind will naturally become calm and still this way. In the process of learning and being confronted with various circumstances, how should we adjust our own mentality so as not to be affected by external forces? Your mind has to be in charge. Be mindful wherever you are. Stay focused whatever you do. Be in a state of conscious existence at all times. Mentally be where you are, whether you are working, chanting a sutra, meditating or doing something else. Be of one mind, not two. As a working adult, manage your time properly. Plan your work appropriately. If you become obsessed with profit making and give yourself too much stress, you may throw yourself off-balance physically and mentally, making things harder for yourself as you lose more than what you gain. So, regulate your body and mind from day to day. In particular, be sure that your mind is clear and in charge. If you can establish right thiking and let your heart be free, you will naturally be able to deal with affairs excellently. When your mind is balanced, the true Way shall be within your reach. Be moderate in all you do. Never be too rash or passive. Neither should you be arrogant nor too servile. In speech, be neither flattering nor relentless. As a student, pay attention in class, take time to review what you have learnt, or you may find yourself having to burn the midnight oil at the last minute to deal with examinations - you can hardly get good results this way. When things happen, especially when major problems arise, there are 4 attitudes or 4 levels to handle them. First, is to face it. Second, is to accept it. Third, is to settle it. And fourth, is to let it go. When any problem - especially a serious problem - arises, avoiding it is useless. The best course of action is to face it. After facing it, you will have to accept it. The problem will still remain even if you do not accept it. After accepting the problem, it is well and good if it can be settled. However, if can't, the mere act of facing it and accepting it is equivalent to having it settled. You may feel upset, distressed or aggrieved, thinking of the problem all the time. At this juncture, you are unable to continue walking down the path you are currently taking. However, another path appears, and you should take this opportunity to let go of the problem. After anything happens, you should let go of the problem after settling it. If we cannot appreciate the accomplishments of others, we cannot be moved. Jealousy will thus arise. Those who speak dismissively of the accolade and honours received by others can never go far. It would be a good thing if one is able to appreciate and marvel at the accomplishments of others as well as be moved by the honours they receive. This is called thinking of being on par with the able and wise. When praising others, we also hope to learn from them. While appreciating others, our actions stimulate others to appreciate these touching incidents or people. In terms of our living environment, this has a positive effect on us, the person involved as well as the people around us. To 'want' is a painful thing; to 'need' is a joyous thing. Only a fine line separates 'want' and 'need'. Sometimes, what we want is not what we truly need. Indeed, there are many things that I want to have, but after careful consideration, it may not be a must to have them. To need is not a sin; to want is not entirely a sin either. If I were to want something and upon getting it, share it with those who need it, then it is the need of others and not mine. Of course, I am allowed to want something that 'I should have'. What does this mean? It simply means that it is something that I can expect to have. For example, do you deserve to have the salary you are getting? Many people do not consider factor like their abilites, positions and the general environment. They strongly crave for what is not allowed, and this becomes something of great distress to them. The problem with people is that they want too much but do not really need a lot. Wanting too much will result in insatiable greed, making one a slave to material goods and plunging one into the abyss of suffering. As the saying goes, 'wisdom comes from experience', there are many things to be learned as well as incidents to be encountered in a lifetime. Whether in smooth-sailing or difficult times, in periods of satisfaction or dejection, the attitude one holds and the choices one makes when faced with problems will determine the success or failure of one's life. An elder once said: 'Life is like a song, complete with joyous and resounding pitches as well as melancholy and deep tones. Only these rising and failing musical notes can together form a touching and melodious song of life.' Hence we should 'accept with calmness and face uwith gratitude' when confronted with all the all the adversities of life, mustering all our courage to improve so as to better ourselves and march towards success. All people will inevitable meet up with problems and bottlenecks in their lifetime. Some can face up to them courageously and get over them smoothly, while others choose evasion and often find themselves in a state of frustration and setback. As long as we are positive, optimistic and proactive in life and work, any problem can be overcome, or at least reduced, in its capacity for damage. Avoiding the problem will not make it disappear but rather cause it to grow. What must be done to acquire the ability to think positively?? One should start from setting goals in daily life and work. Confucius once said: "One who does not think ahead will face up with problems in the near future." By setting life and work goals, with the knowledge that one will be able to get closer to them through overcoming problems faced, one will be able to face up to problems with courage. On the other hand, one can divide an important task or life goal into smaller, less difficult portions and complete them step by step. In this way we can constantly encourage ourselves through the face that 'persistent effort leads to success'. E.g. by being disciplined and engaging in slow jogs and brisk walks daily, one can cultivate a positive attitude towards life as well as keeping fit. Or one can allow oneself to experience a sense of accomplishment and meaning after completing a task, finishing a book or getting to know a friend. In this way, one will gradually develop a positive mentality and be able to face up to difficulties with courage. 1. The hearts of ordinary mortals change with the surroundings. A comfortable environment is the foundation for generating happiness. Things like career success, harmonious family, etc lend credence to the fact that happiness requires a material base. 2. Happiness is felt through the heart; only with a healthy frame of mind can there be happiness. When one is in a bad mood, even if he is an emperor with the world's power, status and wealth at his disposal, he will lead a very unhappy life. Happiness and misfortune are both affected by the law of cause and effect. Everything in this world has its cause and effect. According to the Buddha Dharma: 'To know the seeds of the past, just look at what one receives in this life. To know the effects in the future, just look at what one does in this life.' Hence, besides working hard on normal days, one has to cultivate virtue as well. A famous saying in China goes: 'One should only help people in dire need and not those who are poor.' What is the principle behind these words? Poverty is the seed of the past. To be wealthy in the present life, one has to first repent for one's karmic hindrances; second, to endure the effects of the present; and third, to cultivate virtue and work hard. Every one of us has the ability to achieve happiness. The question lies in how we open our hearts, avoid pain, overcome mental obstacles, as well as practise morality, concentration and wisdom. Practitioners of ability are able to harness desire into their practise, achieving peace and compassion as well as enjoying true happiness, making life full of meaning. More and more research has shown that personal popularity is linked to great achievements at work. Good relations can actually be more important than strong capabilities at work. According to Tim Sander's book, The Likeability Factor, which explores the positive effects on an attractive personality on one's life and career, life is a popularity contest. Everyone wants to work with someone they feel comfortable with, and personal popularity is almost always the key to victory in everything. A person who display psychological strengths is attractive. In other words, likeability is the capacity to present others with a positive emotional experience (such as making colleagues feel great about themselves). The American Harvard Business Review (HBR) survey shows that people generally do not wish to work with an unpopular person, despite how capable he or she may be. They prefer a popular co-worker. Corporations used to focus on employees' competence in working and thinking, but more and more people are recognizing that an employee's unpopularity drives his own work efficiency downwards. If the employee distances himself from the clients or co-workers, he is of little good to the organisation no matter how shrewd or capable he is inherently. Employee's likeability has an effect n customers. Studies show that customers' perception of the staff members who are serving them affect their general feelings about the relevant corporation. According to a particular study in North Carolina, when treated rudely, almost 60 per cent of the consumers will take their business elsewhere, even if they have to spend more effort and money to do so. A restaurant owner in New York believes that a friendly waiter can influence how customers feel about the restaurant, and even negate the negative impact of any mistake made. Furthermore, a popular employee is more likely to get a raise and promotion. A relationship-builder is also usually more valuable to his organisation. The above is very good to ponder of. No wonder the company where I work will go across the ocean just to find the right candidates who have a good personality, attitude and friendly. The value of religion is to enhance one's ability to conquer difficulties and purify his minds, to reach the state of pure compassion. Buddhist Teachings help to purify the unusual feelings, ill will and negative thoughts in us. It guides us to correct path that takes us to the bright future. It's like a wise person with great morals, moving towards a perfect life with pure spirits. According to the Dhamma, life is persistent and continuous. However, there are shortcomings and barriers in life; sometimes we are happy, and sometimes we are sad. In order to achieve real liberation, justice, and happiness, we have to face the reality of life and revamp ourselves constantly. It is the change of 'essence' of our mind and body: From passion-driven to wisdom-driven. Having life with morals is the basis of social harmony, a happy family, trust between friends and cooperation between people. In our society, teachers are responsible for teaching; doctors are to treat all patients like their own family members; workers have to work hard to contribute to the country; businessmen are to run their business legally; soldiers are to fight and protect the country. Confucius had also suggested that generosity, gratitude, forgiveness, justice, honesty and so on are some moral principles in life. With kind spirit, knowledge will be used in a good way, whereas the usage of knowledge by evil spirit will cause disasters and darkness. We are all following Buddhist Teachings and we have to practice them with determination and compassion. Do what is skilful, so that we will bring benefits to every human race. In the process of learning, one should not be worried if his ability is not recognised and he is not given opportunity to perform. Instead, he should worry about whether he can handle the task given. As long as one is determined to work hard and is prepared to learn, the surrounding environment is a secondary issue. It is a blessing to be able to learn, understand and appreciate the value of Buddha's Teachings. One should treat it with respect and put it into practice. Thus, one will be freed from troubles, leaving suffering and obtaining happiness. One who leads his life with passion and goals is unlikely to be influenced by the criticism from others. He cares about what is to be done and what is not done. As a result, he is able to accept comments from others and work well with them. Action is the meaning of life. Action is the energy of life. With action, one can move forward, learn, work with others and participate in group activities. If one is capable of working well with others, he is able to gain their support and help. A person's way of life cannot be based on one particular period. It does not only involve people around us, but also depends on the situation we are in, our practice and our state of mind. No matter how much money we make at work, it is simply just 'getting water'. If we make use of our free time after work to develop our ability in other interest areas, like 'digging our own well', we will still be able to support our lives after we retire, when we are physically weaker than the young. We could change the prevailing circumstances, but the important thing is whether we play our role well. One should never forget: If life is like a movie, then whether or not our roles are important is secondary. So long as we perform our best, our achievements will definitely be affirmed. Contentment is merit. In reality, suffering and joy in this world are mutually inseparable and interdependent. Some people want only the wows and not the woes, but there can be no joy without suffering. If things have always gone well, one can hardly feel blessed. Thus, it is suffering that gives joy its worth, and misfortune that makes the fortunated blessed, just as sickness and poverty makes one appreciate good health and wealth better respectively. While working hard with total commitment is no doubt a positive thing, it is also often a waste of effort when we are too eager to act and neglect to reflect. He who works all day has no time to consider what the meaning of life is. He spends the energy of his entire life, only to gain nothing beyond day-to-day sustenance. Ultimately, we do things for the sake of helping ourselves to think. Only when there is thought can there be any progress. The fact is that the state of life of every individual is totally determined by mentality. If one maintains inner serenity, everything can be done just right with good pace, order and leisure. Leaders, in particular, must not focus on goals and missions alone, but must create a positive, healthy atmosphere for esprit de corps. A flexible way of thinking can often bring about great spiritual strength. Powerful mental capabilities can readily solve a lot of seemingly impossible problems. The Pursuit of True Happiness: A truly happy life is one that is not bound by desires or bedazzled by material goods, and where the heart is able to settle down. Someone once said: Life is like tea, and sampling tea is like savouring life. A single tea leaf appears to be slender, fragile and light, yet it is full of wonders within. When placed in a cup, it fuses with the water inside and releases its essence completely and unreservedly, thus maximizing its full value. We should appreciate the importance of a compassionate heart. When interacting with others, try focusing only on the merits of others and forging close bonds with people. Open up your heart so that you will not feel lonely or unhappy. Believe that a compassionate heart is the basis for the existence of mankind as well as the place where the true value of life lies. We are often oversensitive and tend to overreact to minor matters, or associate every little thing with ourselves. All these will increase our pain. It is important to learn how to transform and transcend pain - in other words, change perspectives - and search for the positive meaning in pain. Our lives are in a state of flux. We should learn how to handle anger and hate, dispelling feelings of hatred through patience and compassion. This is to prevent ourselves from being affected by negative emotions. A sincere motive is the best way to eliminate anxiety and fear. Knowing what one can do and not do will not result in a lack of self-esteem, but rather bring about a strengthening of positive energies. Trhough learning and training, negative thoughts like anger, hate, greed, etc. can be eliminated while positive thoughts like benevolence, compassion, tolerance, etc. can be strengthened. A happy life is rooted in a peaceful state of mind. Your body is what makes your revolution possible. Without health, there can be no true happiness in life. Health is like this pivotal '1'. Your career, wealth and so on are only the zeroes behind. So, to cherish health is to love life. Only with good health can your work and responsibilites have something to hang on to. Only with good health can you serve your country and poeple better. So we need to take care of our health from now on. Physically train yourself harder. Lay a firm foundation from which you shall work hard now and tomorrow. Societal duties, stress at work, the burden of your family - all kinds of troubles that maturing brings along will come your way. You need to deal with them with a positive outlook. At 40, you are moving towards maturity. You can no longer afford to pay the price of acting blindly. As the flames of passion gradually lose their glaring brilliance, you need to light a beacon of rationality for the way ahead. As you mature physically at middle age, your inner being and level of thought ought to be catching up too. Maturity means bidding farewell to the perplexity stemming from uncertainty of vision, the shallowness of living life as a game, and the rashness of giving yourself free rein. Maturity means becoming a little more clear minded in life, a little deeper in thought, and a little kinder and more dignified emotionally. Maturity is not a form of decline, but rather, magnificence. So, from now on, we should pay more attention to the conscious cultivation of our mind. We will complete the tempering of the soul in the crucible of actual practice, resolve the distresses of growing up by means of mature rationality, and be always ready to accept new challenges further down the road. It is a fact of life that things will not always be as we wish. We should dispel all obstacles with a cool head, enlightened thinking and rational actions. We should tap the inherent power in us that resists misfortune, and resolve troubles as best as we can with righteous courage. Furthermore, we should also remind ourselves to prevent the worst results from happening. The more true strength you have, the more fearless you are in the face of everything. Nothing can truly harm you, not even poverty or the suffering brought on by disease. Hesitation and bewilderment are bad habits that hinder you from pursuing progress. Suspicion and jealousy are warped mentalities. When external stimuli trigger wemotional disturbances, you cannot help but fall prey to stress, psychological illusions and deluded thinking, and show signs of losing grip on humanity. Thus, if we seek harmony and peace in life, we must power up with a strong and healthy life. We are to understand the things of this world in terms of conditional causation and cause-and-effect, tackle the six mental poisons of human greed, anger, ignorance, arrogance, doubt and erroneous views by means of discipline, meditation and wisdom, as well as apply the four methods of amicable association in our interpersonal relationships. By being good to life, we can make it fuller and more exciting. Life is an enormous stage, where everyone plays a different role. Tragedies and comedies of life unfold every day on this planet. Every one of us plays the lead, each getting a taste of sourness, sweetness, bitterness, spiciness and saltiness, as well as experiencing joy, anger, sadness, shock and fear. From childhood to maturity, we all go through a series of different roles. Yesterday was a special day. It's 10.10.10. 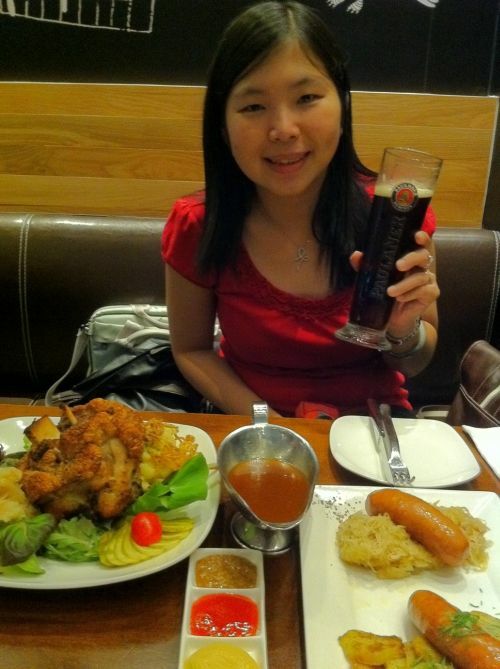 At the same time I had dinner appointment w/ friends to celebrate the above. Supposedly we wanted to go during weekend 'cos it would be much crowded and more fun, but too bad, it's all fully booked, so we only managed to book our dinner yesterday (Sunday). We supposed to go 4 of us, but one of my friends 'fang wo men fei ji', which means... no news, then last minute cancel her appointment with us. 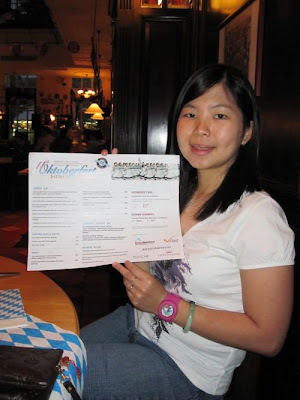 I even bought her portion of beer vouchers, but today I managed to ask her to pay her part and asked her to use the voucher either today or tomorrow 'cos tomorrow will be the last day. We weren't drinking much but the alcohol level was enough to make us slightly feeling high. 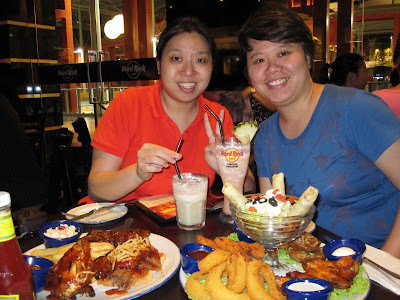 We went back at about 10.30pm, and walked back home from MRT Station. PY and I talked about our feelings.. even secrets. Hahahaha.... so much fun!! Reached home about 11.30pm. I slept at about 12 plus and this morning went to work like usual. 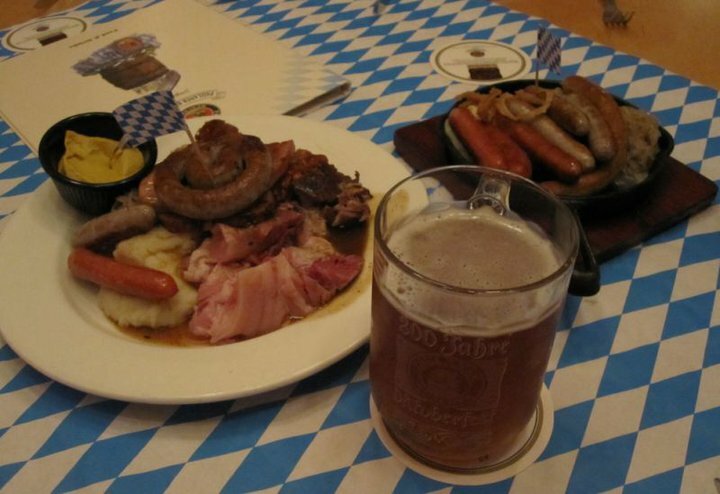 Hehehe... Hope next year I'll still get a chance to celebrate Oktoberfest again. Maybe abroad? I believe in a fate. People whom you meet, such as your family, your friends, your spouse, your bf/gf, your colleagues, even those you don't know and you met surround you. Places where you've been, such as your home, your school, your travelling places, your working place, wherever it is. Fate can be short, can also be long depending on the past deeds that we made and bring into this life. Our characters, personalities are built slowly since we were young. Just wonder how amazing it would be if you looked back on those past memories behind you, your present situation, and you may expect to meet more and more people, go to more places in the future. Leave it to the nature or shui yuan.... Will be the best approach for our thinking. Yes we have a drive to make it happen. We have a dream to make it come true. But at the end, we still need a fate to accomplish it, and need to pray hard still that your dreams would come true. Yesterday we attended my friend's daughter birthday party in the afternoon. She's one year old. I went there last time when she was one month old. Time flies. Many thing happened and changed. 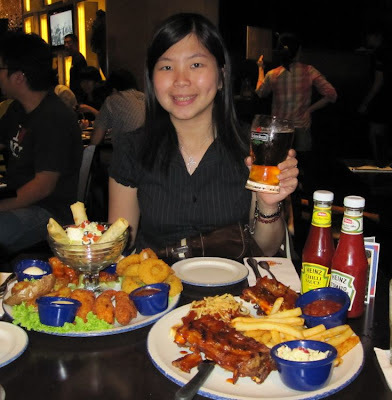 My friend chit chat about how her working place now is like, how her job, etc. I feel lucky that I've left that place much earlier 'cos I don't like the politic they are playing. Anyway, everywhere is the same, only how affected is it to your situation. I don't wanna know about it and I hope I won't get involved. Release me please! We watched the show at 8.30pm. We sat at second row from front. Wow... So good. I could have much better view from there. Hehehe... The show lasted for 1.5 hrs then we went back home. We bought a drink and drank it on the way home. I finally tasted the Guiness stout, and knew what it tastes like. Quite strong but still manageable. Hehehe... Reached home 11 plus and slept at about 1am. Now it's another new day, a brand new week and month. Gotta do my another half of closing. Hope everything goes on smoothly... Have a great day!!!! Still another half job to do, but I could only do it next Monday once my journal has been posted to the system. So I don't want to think too much now. Just do what I have to do in present time. After finishing my journal, it's time for relaxing!!! Yesterday was also Ellen's last day for her temp job and she was free to have dinner with us. That's why we met up for this dinner!!! 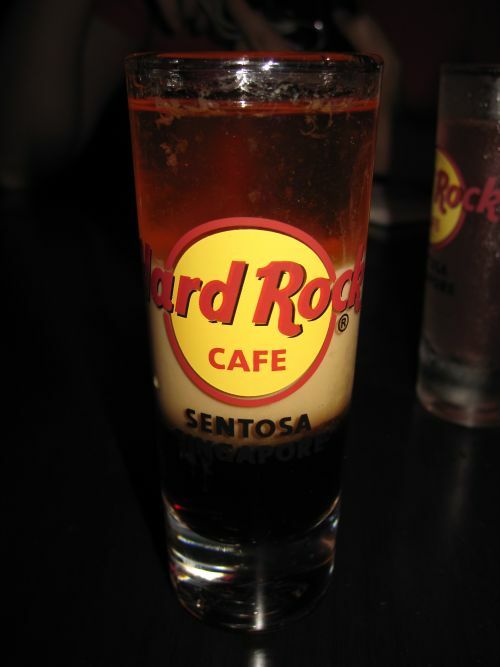 We headed to Hard Rock Cafe at Sentosa. My friend, PY, had waited for us since 7.30pm. We reached there about 8.25pm. Pu hao i se lor.... Then another friend had been hungry. So sorry gals!!! She immediately ordered food and we ordered our drinks. Then... it's makan time!!! After makan, we tried 2 shot glass of cocktail, share share. One is B-52, consists of Kahlua, Baileys and Grand Marnier. Another one, forget the name, also forget the ingredients. Kekeke... But there was absolut vodka, triple sec bols on it. There was live band at 9.30pm.We ate there until 11pm, then went back home. Feel better as I didn't to think about the work.. hehehe... There were so many people having birthday on that day. The band sang birthday song for 3 times and there were lots of people having birthday. 10, maybe? Well.. it's October now. It's busy month. Full of activities ahead. Same with me. Just hope we're blessed with good health all the way... which is... impossible, rite? Kekeke.... Anyway... today is Saturday!! Just lazy around and take more rest for today and tomorrow there are few things to do... Well.. enjoy your weekend everyone!! !